You've already got the celebration going with a little bubbly. 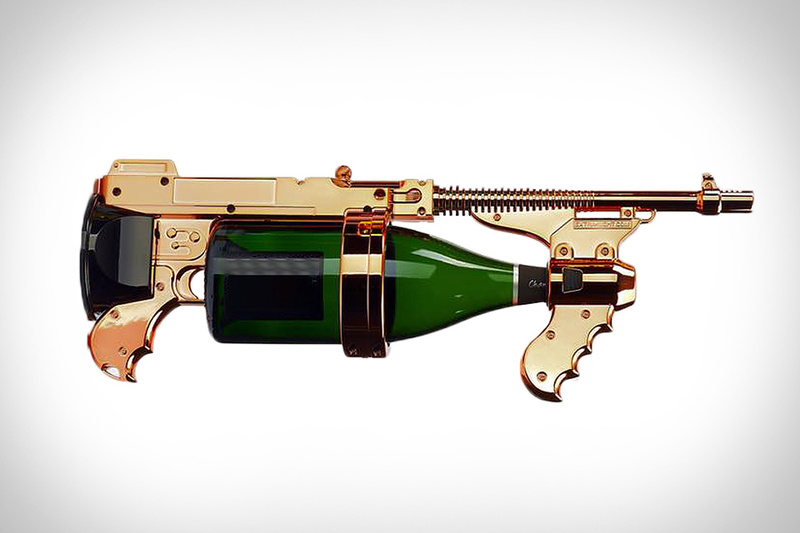 Crank the party up another notch with the Champagne Gun. This ridiculous contraption is part machine gun, part Super Soaker, using magnum-sized bottles as its fuel. Just load your bottle, give the thing a healthy shake, and enjoy a stream of champagne that travels around 20 feet for up to 45 seconds. You can also use it as a fancy holder for times you'd rather pour and drink your champagne, instead of wasting it, and its metal body looks great behind a bar, too. Available in gold, chrome or rose gold. Lots of us enjoy a good glass of wine. But unlike a glass of beer, a glass of wine requires a commitment to drinking the whole bottle, since it goes bad in about a day. Unless you're drinking from the Kuvee Smart Wine Bottle. This intelligent wine delivery system uses bottles that keep oxygen out of the equation completely, allowing each one to last for up to 30 days. They can be swapped out easily, so you and your family/guests can enjoy different styles of wine at the same meal without the expenditure of opening multiple traditional bottles. 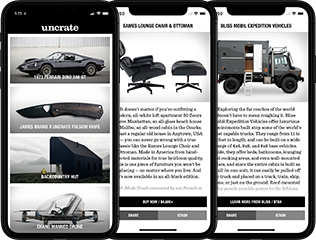 The built-in touchscreen shows you what you're drinking, in-depth info you won't find on a traditional label, and even lets you rate the wine and order more right from the bottle. Most wine collectors would love to have a dedicated cellar in their home. When that's not possible, Somi Wine Cellars are the next best thing. Made by hand in Portland, OR from regionally-sourced wood, they're designed by engineers, resulting in a robust, arch-topped structure that's kept at an optimal temperature by a top of the line cooling system. They're lined with high-performance insulation and filled with a two bottle-deep universal rack system, then covered with salvaged barn wood, outfitted with handcrafted hardware, and finished to match your decor. Available in capacities ranging from 120 to nearly 450 bottles. You'd expect nothing less than luxury when you see the Rolls-Royce name, and that's exactly what you get with this Rolls-Royce Cocktail Hamper. The interior is decked with American Walnut wood and premium natural grain leather, while each implement was custom made, from the decanters, shakers, and fine cotton napkins to the muddler and strainer engraved with the 'RR' monogram. Each glass included takes a month to make using a technique where the glass is blown into beech wood molds, while the rims are finished in platinum. Even more exclusive than the automobiles, only 15 of these impressive hampers will be made. If you've ever dreamed of making your own moonshine but were too lazy to splurge on a full setup, this Tabletop Moonshine Still looks like the perfect alternative. It's constructed from the same stainless steel used in premium cookware, ensuring your hooch stays safe. It's easy to use, and with a 1/2 gallon capacity, you'll have 7 to 12 ounces of your very own white lightning ready to be bottled in a Mason jar before you know it. Years of care went into the production of your favorite whiskeys. Similar care was put into the making of the Norlan Whiskey Glass. The result of over one and a half years of development, it combines the aromatic benefits of a snifter with the aesthetics and casual style of a tumbler, thanks to a double-walled design. Inside the glass a specially developed protrusions that help focus the drink's natural aromas when swirled, releasing every nuance of the spirit. They're hand-blown from Borosilicate glass and available in sets of two, four, six, or eight. Straight from the brewery freshness. The convenience of a K-Cup. The Pico Home Brewing Machine is a fully-automatic solution for brewing your own quality beers at home. Leveraging technology from the award-winning Zymatic brewer, it uses ready-to-brew ingredient kits called PicoPaks — available from over 50 breweries — to take the guesswork out of the brewing process. It takes roughly two hours to brew and 5-7 days to ferment a 5L mini-keg, giving you the opportunity to enjoy a different beer every week.